To maintain the quality of the data, we also offer an annual service and calibration check for all stations before the start of the fire season. The above sensors are the minimum required to calculate fire weather indices that allow operators to manage the fire risk in their area. Unlike many other weather stations in the market, we publish the specifications for all the sensors used so that you know what quality the instrumentation is. We use dataloggers manufacturered by Campbell Scientific who are the industry standard for demanding research applications. 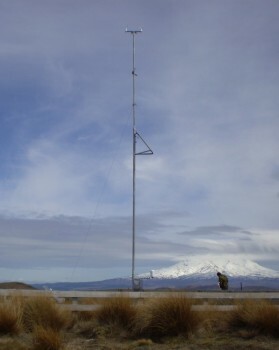 The datalogger is the brains of the station, taking readings every three seconds from the attached meteorological sensors. These are stored hourly and daily. All stations have telemetry equipment that allows the data to be retrieved by interested users. Most of our fire weather stations have data retrieval via landline or cellphone telemetry. Some users choose to collect all the data themselves using Campbell Scientific and WeatherPro3 software, while others access the data via the NRFA web site. The low power requirements of the datalogger mean that the station can easily be powered by solar panel. This recharges the 12VDC battery used by the datalogger. Alternatively, the station battery is charged using a mains powered charger. This is the cheapest option for stations with a power supply close by. This recharges the 12VDC battery used by the datalogger. The 10m tilting mast is designed to be easily lowered by one person for servicing of the wind instruments. These, and the Temp/RH sensor are connected using environmental connectors so they can be removed without rewiring the datalogger. The datalogger, battery and telemetry components are all enclosed within the sealed stainless steel enclosure.